If you plan on partying on Super Bowl Sunday, you need to make sure you have a way to get home safely. TAMPA, Fla. — Are you or your friends planning to party on Super Bowl Sunday? If so, you will want to keep this information handy to make sure everyone gets home safely. “The Super Bowl often means good times shared with friends and family, but it’s also a weekend where drivers may get behind the wheel while under the influence of alcohol,” said Amy Stracke, managing director of traffic safety advocacy for AAA – The Auto Club Group. AAA strongly recommends you arrange in advance a way to get home so you don't have to drive drunk. A designated driver is a person who abstains from alcohol on a social occasion (such as a New Year's Eve party) in order to drive his or her companions home safely as an alternative to driving under the influence. American Addiction Centers offers five tips on being a designated driver . The TECO Line Streetcar System runs on rails that connects Ybor City, Channelside and Downtown Tampa. It is now free to ride the streetcar system. The line operates until at least 11:00 p.m. More Info: www.tecolinestreetcar.org . Taking a cab or taxi is also a good alternative to driving during any holiday. To find a car service near you, download a cab-finding app like Curb: www.gocurb.com . The Downtowner is an on-demand ride service operating in the following neighborhoods: downtown Tampa, the University of Tampa, the Channel District and Tampa Heights. Service is available Mondays to Thursdays from 7:00 a.m. to 9:00 p.m., Fridays from 7:00 a.m. to 10:00 p.m., Saturdays from Noon to 10:00 p.m., and Sundays from Noon to 8:00 p.m. The free service is thanks to the Tampa Downtown Partnership. You can get a ride by downloading the free Downtowner app . Ride-sharing is a popular alternative to driving or taking a taxi on a holiday weekend. When there is high demand, Uber uses surge pricing. Fares can increase significantly during the busiest time of the night. Riders who use rival Lyft will also see a version of Uber's price surge, called "Prime Time." AAA's free "Tow-to-Go" service is active for Super Bowl weekend. “Tow to Go aims to provide alternative transportation options, so we can keep motorists safe and impaired drivers off the roadways,” said Stracke. 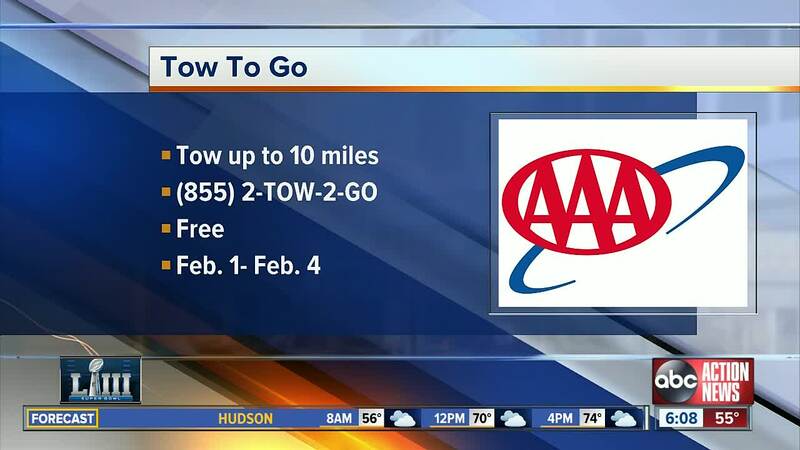 Whether you are a AAA member or not, you can call for a Tow to Go ride starting at 6:00 p.m. on Friday, February 1 through 6:00 a.m. on Monday, January 4. AAA will safely get you and your vehicle home or somewhere safe within 10 miles. Since it started in 1998, Tow to Go has safely removed 25,000 impaired drivers from the roads. The service is designed to be used as a last resort to keep drunk drivers from getting behind the wheel.